· ✅ FLIGHT PROVED DESIGN ► These propellers can be safely used on your DJI Mavic Pro drone. · ✅ EASY TO FIT AND REMOVE ► The folding wings are equipped with a quick release system that offers a solid and secure fit. · ✅ PERFECT SPARE PARTS ► Fully compatible with the original DJI 8330F blades (CP.PT.000578) with excellent reliability and responsiveness. · ✅ DO YOU NEED MORE? ► Other CamKiX accessories are available to improve video, improve handling or further protect your DJI drone. 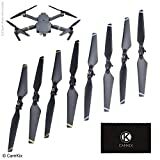 · CamKiX Propellers for DJI Mavic Pro - 2 Sets (8 Blades) This set of propellers for your DJI Mavic Pro gives your drone compact 2 sets of new wings. These propellers can be safely used on your DJI Mavic Pro drone. The folding wings are equipped with a quick release system that offers a solid and secure fit. Fully compatible with the original DJI 8330F sheets (CP.PT.000578) with excellent reliability and responsiveness. Other CamKiX accessories are available to improve video, improve handling or further protect your DJI drone. Contains: - 8x Folding Propellers for DJI Mavic Pro - 1x CamKix Cleaning Cloth If for any reason you are not satisfied with any CamKix product, please feel free to contact us. We take full responsibility for the quality of our products and will do our best to solve your problem quickly and efficiently! Camkix-USPTO # 86127507- is a trademark and protected by the U.S. Trademark Act. CamkiX products are sold only by authorized sellers.